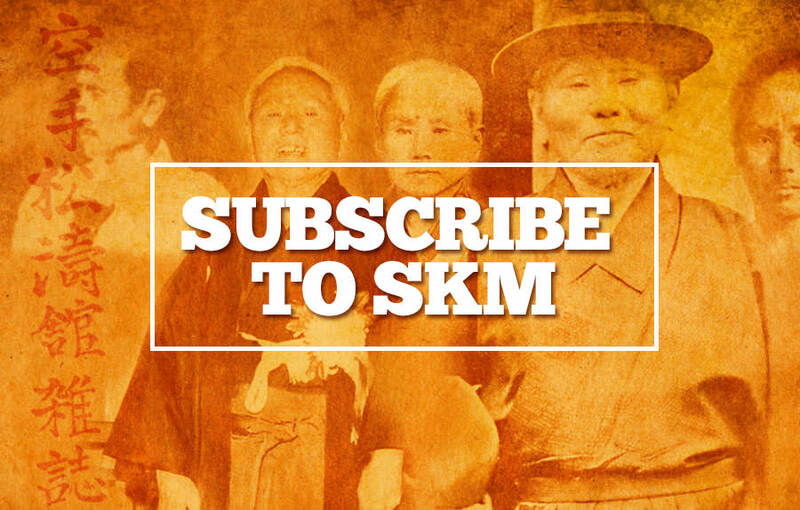 Welcome to SKM issue 126 and I hope you all enjoy the various articles in this edition. There’s a joint interview with senseis Naka and Murakami. A huge thank you once again to Seamus O’Dowd 5th Dan SKIF for conducting the interview for SKM. It’s great to see the JKA and SKIF senseis training and teaching side by side, this is how it should be as I’ve said many times before, to my mind, Shotokan Karate-do is ‘one’ family. I found it very interesting that both sensei sighted oie zuki as their favourite technique and as Naka sensei said, oie zuki is Shotokan’s most important technique. It really is Shotokan’s signature technique and only now after over 40 years training can I see the depth of this so called ‘basic’ movement! Oie zuki is used more in Shotokan karate than any other traditional style and virtually only Shotokan competitors have utilised oie zuki in tournaments over the past 50 years. If you want to see the technique performed to perfection take a re-look at Naka sensei in the film Kuro Obi, or old movie films of Yahara sensei or Osaka sensei scoring with oie zuki. If you think you can do oie zuki really well, try applying it on a makiwara, bag or pad and see if you can time it to perfection, it’s a total, whole body action and far more powerful that gyaku zuki when executed correctly. I feel that it’s great to re-visit these ‘basic’ (?) techniques, and an eye-opener if truth be told! The timing involved in attaining a smooth, powerful oie zuki takes many years to achieve. Go back and check out oie zuki in Nishiyama’s book ‘Karate The Art of Empty Hand Fighting’ it says... “As the stepping foot passes the stationary foot, begin the straight punch.” And in Nakayama’s ‘Dynamic Karate’ it’s exactly the same principle. How many students actually do that? Not many, I know that for a fact! Most fire the punch far too late! If you have SKM issue No.86, sensei Tom Kompier (Netherlands) demonstrates the detailed breakdown of oie zuki brilliantly, check it out! This is a very difficult skill requiring really good timing. There’s absolutely nothing basic about oie zuki when done correctly, no wonder it’s Shotokan’s signature technique. We have a report by Angelo Sanna 6th Dan on the WTKO course in Ireland earlier this year. Many students like to train with different instructors on these courses, in order to experience the various training methods, ideas and technical variations employed by the different instructors. The principles are the same, but the process can be quite diverse. 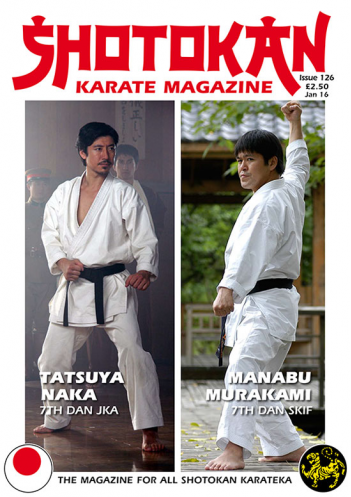 Dave Hooper 4th Dan JKA, has been one of the most popular contributors to SKM over many years. His writing is always extremely humorous yet deadly serious when discussing karate and his allegience to the JKA is unquestionable. He has been dedicated to the JKA since living in Japan for the past 35 years. Dave’s articles have always been a bit controversial and I want to point out that these are totally Dave Hooper’s personal opinions and views based on his own considerable experience. THE RELATIONSHIP BETWEEN BREATHING, STANCE, HANDS and MARTIAL POWER. By Peter Edwards. Author: Sensei Peter Edwards 6th Dan, a Shotokan practitioner for more than 40 years. The division of karate training into basics, kumite and kata has many advantages. It is possible to learn the shapes and sequences of movements quickly whilst the hierarchical kyu-dan grading system provides a motivational support to progress upwards. Unfortunately it is too easy to “go with the flow” and develop a superficial attitude to karate training and come to believe it is only a set of exercises to be practised on a couple of occasions a week in a group training session. Lack of curiosity and questioning very often means that even karate students with decades of experience seem to know very little about generating any degree of real power in their punches, blocks and kicks that could be of use in a real life fighting situation. Is this because martial power “is not in the syllabus”? Of course not, but despite Kanazawa Sensei’s best intentions to improve karate knowledge via his own seminars, books and videos/DVDs, very few individuals analyse their own karate training in a systematic manner. At the end of every exercise set, Kanazawa sensei returns to his yoi position and performs two separate breathing patterns. The first is normal or Buddhist Breathing, where the abdomen expands during the in-breath and contracts during the out-breath. The second breathing pattern is the one which causes students most difficulty. It is reverse abdominal or daoist breathing where the in-breath fills the upper part of the lungs causing the abdomen to move inwards a little. On the out-breath the hara is tensed and the abdomen expands outwards. The point of these two distinctive breaths is to bring the body and mind back to a state of calmness in order to face what is yet to come. Very basic, but how many students apply their minds to these two breathing patterns, never mind the other six external martial arts breathing techniques and their variations in the study of kihon and kata? This leads quite naturally to applying breathing technique to both static stance and moving stance training. It is necessary to experiment with the length of the in- breath and out-breath and relate this to the practise of karate in static stances and then in moving stances. This study will be enhanced by relaxing deeply into stance. The principle of rooting or trying to sink the body mass below the waist by contracting the leg muscles the very least (just to stop the body from collapsing) will be learned. The idea of stretching the spine so that the body mass above the waist is raised in coordination with the finishing of a karate technique is learned. Peter practising kata Gankaku in his garden. The performance of punches, blocks and kicks whilst continuously practising this movement analysis thinking will allow the self discovery that stretching into the shapes of the kata moves for example, harmonises with energy flows and thus magnifies the amount of martial power in a biomechanically correct way. Practising karate as slow sets of “extreme stretching” exercises whilst breathing like a hunting tiger is very beneficial for overall wellbeing and can be a tool for getting students to harmonise breathing and movement. When the same sets are repeated quickly they become ‘karate’ again! This section is really only for dan grades and above as it would be an exceptional kyu grade student who would be ready to understand breathing and movement to such a degree that their martial power training could be taken to the next level. ‘Hands’ in this sense means the physical form or shape of the striking hand or foot. To comprehend how this martial power is generated it is necessary to appreciate both how the body’s musculoskeletal system operates and have a knowledge of Ki as well. Both of these fields are lifetime studies in their own right. Reference to both nomenclatures can be used to explain martial power. The moving body should not be seen as the individual actions of separate muscles, but the system works as a whole by creating a series of spiralling movements all the way up the body through the legs and torso. In normal everyday activities, individual muscles and joints are rarely taken to extreme limits. The body develops patterns of movement which share the effort between numerous parts of the musculoskeletal system so that no individual part is overstretched. Advanced karate training weaponises the body so that high speed techniques taken to the extreme limit of an individual’s own unique normal range of movement deliver a pulse of energy without overstretching. Close study of the film footage of Kanazawa sensei performing the 26 Shotokan Kata put out by Centre Mind Films many years ago show in particular all of his open hand techniques such as shuto, teisho or nukite finishing with an almost imperceptible twitch of the hand. The flow of Ki stops for a split second. The natural limit is harmonious with the end of the breath cycle. A moment later the flow of Ki will reverse its direction. In the case of an out-breath, the flow of Ki has gone from the inside of the limb to the outside. In the case of an in-breath from the surface of the skin inwards through the muscles and tendons. Pic 1: Second movement of Sochin (Sochin-dachi stance with left foot forward, right hand in a vertical knife hand block) During this slow move stretch the spine in conjunction with the slow out breath. Below the waist keep the leg muscles relaxed. This way of finishing a technique acts as an initiator of whatever technique is to be delivered immediately afterwards, allowing a massive amount of energy release to be generated. Unlike the Ki flow this energy can be measured in a physics experiment. The ‘twitch’ means the hand has relaxed slightly from its extreme range position in a very short time span enabling the mind to recognize this physiological memory position and fire off a signal for the next technique to start. A good example of this is the shuto hand in the second movement of the kata Sochin. The shuto is both a slow movement and a gyaku hanmi shuto. The following two tsuki punches can be delivered with so much power that when executed by an accomplished karateka such as Nobuaki Kanazawa, can make the dojo floor shake. It is not difficult to learn how to generate the kime needed for a whole variety of hard/soft techniques which form the basis of the standard Shotokan syllabus by taking care to practise them within your own natural range of movement. The classical study of Ki generation and its leading to the limbs is also referred to as ‘Four Gates Breathing’. The four gates are the two palms of the hands and the two soles of the feet. The transmission of this knowledge of martial power is best done on a one to one basis or with one instructor and two students. This is because its manifestation is easier to feel rather than to see. In Kanazawa sensei’s Jiyu Ippon-Kumite syllabus there are many opportunities to use shuto, particularly on the pull outs, which if the defender gets right, i.e. harmonises breath, stance and hand together, will give the attacker quite a shock. Once this can be done at will and with all karate techniques, whether offensive or defensive then it is his or her duty to be very careful or their Jiyu Ippon partners will be fewer and fewer in numbers due to injury! Pic 2: The last part of the second movement of Sochin kata involves stretching the knife hand slightly to the right (up to its natural limit position) whilst keeping it as vertical as possible. The relaxation of the hand acts as the initiator of the next move (left hand punch). Breathing, stance and hands study is essential to develop what is known as hard/soft martial power. Large group training will give the student an appreciation of the shape and sequence of a karate movement. To advance beyond this level and develop powerful effective karate techniques involves a lot of research and specialist training much of which originated from other martial arts. Pic 3: Execute the left and right punches still in the same Sochin-dachi stance. These two punches are completed as rapidly as possible. The finish of the first punch acts as the initiator of the second. Reverse abdominal breathing is utilised. One short inhalation with two powerful Hara tenses in quick succession to harmonise with the finish of each punch during the out breath.